So I’m on a new diet. It consists of all bread pudding, all the time. It’s really easy and you’d be amazed at how it transforms your figure! First, go over to Runcible Spoon in Nyack and order their Croissant Bread Pudding. Yes, I typed that correctly: this is made WITH CROISSANTS. Bread pudding, in case you have never had it, is typically made with bread combined magically with milk, sugar, eggs and often raisins. The croissants here are an extra-decadent twist. Beware: Joo Hee behind the counter at Runcible will likely serve you up a piece so ample that you’ll need a wheelbarrow to get it back to your table. I can only imagine how much the whole pan weighs. Joo Hee tells me that right after it comes out of the oven, it is plumped up to about twice the size in this photo. This pudding is creamy, almost flan-like in some bites, while the croissant lends it a flaky texture and buttery flavor in other bites. For lunch, head across the Tappan Zee to nearby Tarrytown and find a seat at the Sweet Grass Grill. Though the entrees here are delicious, skip straight to the…wait for it…bread pudding, which is served in this cute little muffin shape with whipped cream on top. This one features berries, banana, and a bit of chocolate. For dinner, pop into to Didier Dumas Patisserie on Main Street in Nyack for a slice of bread pudding heaven. Each serving has ribbons of chocolate and pockets of fresh raspberries nestled throughout. The taste and proportions here are simply divine. And Chef Dumas’s version presents beautifully, so if you’re entertaining, it’s great to pick up several pieces to share with friends who have your same… nutritional objectives. Oh I’m all over that diet. This puts my old carrots-n-water routine to shame! I think the two diets can be combined nicely. Carrots-n-water would make an excellent dessert, just be sure to bake them with lots of brown sugar. My mouth is watering from that first photo. I don’t live anywhere near there unfortunately. Oprah Winfrey needs to add TPC to her media conglomerate. You know she wants to. All puddin’. All the time. None of my diets have been working – I am going to try this! 🙂 The croissant one looks good but that one with the rasberries looks even better. Can’t recommend this enough. The changes in my figure have been truly….remarkable. You know, this should be illegal! 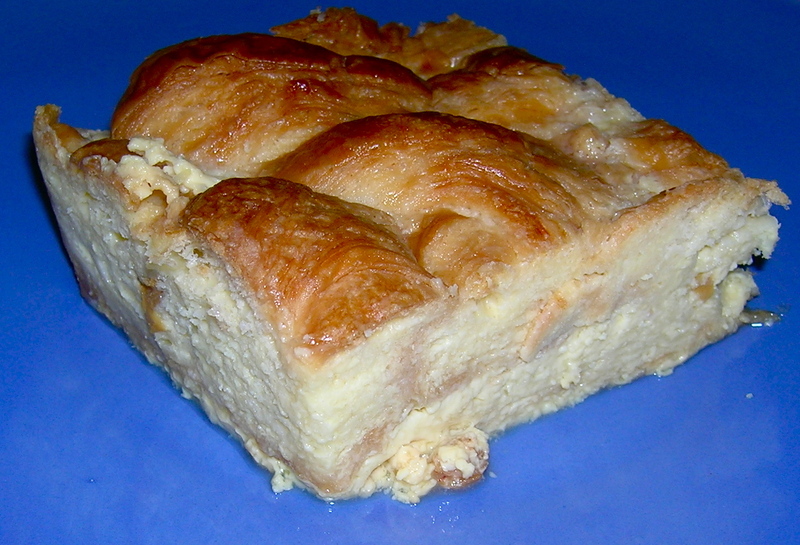 I just discovered that a “Strata” is very much like a bread pudding and can be savory or sweet. Just in case you want to cheat on your diet a little. I have heard of Strata. I think I had it once long ago. I will have to add this “layer” into the mix.